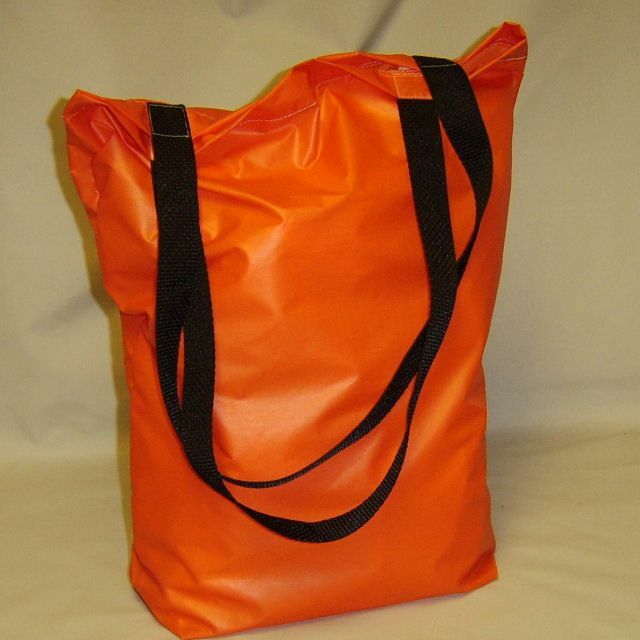 Sew your own basic tote bag in the size you want or need. Use these as gift bags and you automatically increase your gift by giving a re-usable bag that is bound to come in handy! I've never meet anyone who has enough bags! Tote bags are always needed for one thing or another. Think green and use them for your shopping rather than adding to the landfill with plastic grocery bags. Keep them in your luggage... you know you always come home with more than you left home with! Keep a couple in the trunk of your car... just in case... you know something will come up! Fabric to the size shown in the chart for the bag size you want to create. Nylon fabric is my favorite as it folds compactly and is resistant to water. 2 - 20" pieces of 1" wide webbing. The length of the straps may be varied to meet your needs or desires. Carefully use a lighter or candle to gently melt and fuse the raw edges of nylon webbing to prevent it from unraveling. If you are using cotton webbing, zigzag or turn under the edges of the webbing when you are attaching it to the bag. Note: All measurements can be changed to suit your needs. Fold the length of the fabric in half with the right sides together. Apply a seam finish to the seams. Turn under the raw edge by 1/8 to 1/4" and stitch in place. Turn under one inch of the top edge to the inside of the bag. Stitch the edge in place stitching as close to the edge as possible. With the bag wrong sides out, fold the sides of the bag to be over the bottom fold of the bag. Measure 2" from the point and sew a straight line across the bag as shown in the photo. Using the measurements on the cutting chart or finding a placement that is comfortable for you, place the straps an even distance from the side seams. Test for even placement by refolding the bag matching the side seams. Sew a square at the end of the strap to attach it to the bag. A sewn square increases the durability of the straps so they don't rip off at the most inopportune time! Add embroidery or appliqués to suit your needs or desires.